The invention relates to data processing systems and more particularly to the instruction mechanism in stored program data processors. A computer instruction is the specification of an operation to be performed, and may include the address of one or more operands on which the operation will be performed, the address for the location of the results, and an address of the next instruction in the sequence. These specifications or addresses may be implicitly defined, that is the machine will assume, in the case of the specification of the next instruction location, that the instructions lie in sequence. That is, the next --instruction is contained in the address following the location of the current instruction. The location of the current instruction is kept in a register called the sequential address register (SAR). During the execution of an instruction the SAR is advanced by one address unit. In all systems that use SAR's, there must be an additional mechanism for initializing the value and for changing values at certain points in the program in order to execute subroutines, for example. This mechanism is a special instruction, called "branch". There are two basic kinds of branch instructions: a branch without stacking and a branch with stacking. Both types of branch cause a new value to be substituted for the next sequential address in the SAR and hence define the start of the location of a new sequence of instructions. A branch with stacking instruction causes the storage in a LIFO stack memory of the next sequential instruction address, before the original instruction sequence is altered, and can be used to execute a subroutine, for example. This enables the system to return to the original sequence at the stored address. For definitional purposes, the term "branch" as used herein will mean the branch with stacking operation. After the completion of the subroutine operations following a branch instruction, the program should return to the point in the original instruction sequence which was the point of departure for the branch. This is accomplished by a "return instruction." The instruction address to which the program is to return must be stored at the time the branch instruction was executed. In order to accommodate several consecutive branch instructions, the last in-first out (LIFO) instruction address stack must be provided to store those return addresses. The conventional way to provide an instruction address stack for a pipelined instruction architecture is to put a large, dedicated register file in the first stage of the instruction pipeline because this is the stage that determines the order of execution. However, with the advent of large-scale integrated circuitry, substantial reductions in unit cost can be achieved by condensing the instruction processing and arithmetic circuitry for the processor onto a single integrated circuit chip. However, the large storage functions of data storage and instruction storage must be carried out by separate memory chips since the available area on the processor chip is limited. Although it is desirable to maintain a record of return addresses for instruction branching which is immediately acessible by the first stage of the instruction pipeline, the inclusion of such a large storage function on the same integrated circuit chip containing the instruction and arithmetic processing elements, is not feasible. However, the placement of the return address storage function in the data storage could not be achieved in the prior art, even if the data storage were on the same integrated circuit chip, because a return address could not be accessed from the data store until several machine cycles or phases after the return instruction was read by the first stage. The placement of last in-first out (LIFO) stacks in the data store of a data processing system is not new. For example, U.S. Patent 4 041 462 to Davis, et al, assigned to the instant assignee, describes carrying out subroutine linkage by using an LIFO stack in the data storage. However Davis, et al, were not confronted with the concurrent pipelined instruction execution which is the problem to be solved for a sequential phase instruction pipeline. Davis, et al, have their instructions invoke the accessing of the stack in the data store. This would, of necessity, degrade the throughput of the instructions in an instruction pipeline. It is therefore an object of the invention to provide an improved sequencing instruction mechanism for an instruction execution pipeline in a data processor. It is another object of the invention to provide an improved pipelined instruction mechanism for a data processor completely contained on an integrated circuit chip, having a reduced power dissipation. It is still another object of the invention to make use of unused instruction phases to carry out branch or return operations in an instruction pipelined mechanism for data processor. It is still a further object of the invention to provide a processor which can access return addresses in an instruction stack located in a data storage which is normally accessed in machine cycles subsequent to the instruction fetch machine cycle, in an improved manner. It is yet a further object to share the data storage function and the instruction stacking function in the same data storage device accessed by a multiple phase instruction pipeline, without degrading the performance of that pipeline. These objects of the invention are accomplished by the features of claim 1. Further advantageous embodiments are characterized in the remaining claims. In this manner the advantage is achieved that an instruction pipeline for a data processor can be used, in which instruction execution is carried out in a sequence of phases which include fetching the instruction from an instruction storage, computing a data storage address from the fetched instruction, accessing the data storage at the computed address to obtain a datum operand, and then carrying out the logical or arithmetic operation on the accessed datum in accordance with the fetched instruction. Branch and return instruction are accommodated by providing a return address stack in the data storage, which stores the next instruction store address to be returned to after a branching operation has been completed. Since the instruction address stack in the data storage cannot be directly accessed by the instruction fetching stage of the pipeline until several instruction execution phases have transpired, without degrading the performance of the pipeline, a stack register is provided in the instruction fetch stage of the pipeline which contains a duplicate of the instruction store address presently residing at the top of the instruction address stack. Then when a return instruction is encountered in the instruction fetch stage, the address of the next instruction to be returned to in the instruction storage is immediately available without interrupting the flow in the pipeline. A stack pointer in a stage of the pipeline between the instruction fetch stage and the data store access stage, then takes advantage of unused instruction phases in the pipeline, to cause the data store access stage to read the next available instruction store address from the instruction address stack therein and load it into the stack register in preparation for the next return instruction. Thus, the data storage and instruction stacking function can be shared in the same data storage device which is accessed by an intermediate stage in the multiple phase instruction pipeline without degrading the performance of the pipeline. An additional advantage accrues in that the partitioned size of the address stack in the data store can be decremented and the saved space can be used for data storage. Figure 1 is a functional block diagram of the real time signal processor. Figure 2 is an illustration of the instruction pipeline operation. Figure 3 is a functional block diagram of the instruction sequencing and fetch stage 1. Figure 4 is a functional block diagram of the address generation stage 2. Figure 5 is a functional block diagram of the data store stage 3. Instruction pipeline for a data processor is disclosed, in which instruction execution is carried out in a sequence of phases which include fetching the instruction from an instruction storage, computing a data storage address from the fetched instruction, accessing the data storage at the computed address to obtain a datum operand, and then carrying out the logical or arithmetic operation on the accessed datum in accordance with the fetched instruction. Branch and return instructions are accommodated by providing a return address stack in the data storage, which stores the next instruction store address to be returned to after a branching operation has been completed. Since the instruction address stack in the data storage cannot be directly accessed by the instruction fetching stage of the pipeline until several instruction execution phases have transpired, without degrading the performance of the pipeline, a stack register is provided in the instruction fetch stage of the pipeline which contains a duplicate of the instruction store address presently residing at the top of the instruction address stack. Then when a return instruction is encountered in the instruction fetch stage, the address of the next instruction to be returned to in the instruction storage is immediately available without interrupting the flow in the pipeline. A stack pointer in a stage of the pipeline between the instruction fetch stage and the data store access stage, then takes advantage of unused instruction phases in the pipeline, to cause the data store access stage to read the next available instruction store address from the instruction address stack therein and load it into the stack register in preparation for the next return instruction. Thus, the data storage and instruction stacking function can be shared in the same data storage device which is accessed by an intermediate stage in the multiple phase instruction pipeline without degrading the performance of the pipeline. The real time signal processor (RSP) is a single operand general purpose processor with a 16-bit data flow and a 24-bit instruction set which is particularly adapted to implement signal processing algorithms. The RSP has a pipelined instruction organization designed to achieve maximum processing throughput without requiring high performance, high power circuits. The architecture contains a full repertoire of arithmetic, logic, and control instructions including a variable precision multiply and a 32-bit divide. The entire processor, exclusive of the memory, is designed to be implemented on a single VLSI chip 5 as shown in Figure 1. 4) Perform arithmetic operations and load result. For any one such instruction, these four functions must be performed sequentially. The pipelined instruction concept takes advantage of this characteristic of the instructions. The architecture of the RSP assigns a distinct area of hardware to each function. As the stage which performs one of the four functions acts upon one instruction, another stage may be used to act upon another instruction simultaneously. The performance of an operation on an instruction is referred to as the execution or a phase of that instruction. Phase 1 of an instruction is the instruction fetch. Phase 2 is the effective address generation. Phase 3 is the data memory access, and Phase 4 is the arithmetic function execution. The distinct area of hardware which implements a function is referred to as a stage. The hardware stages execute the four phases for four different instructions concurrently. Since the RSP was designed to be built on a single LSI chip 5, space on the chip is at a premium. The large storage functions of data storage 8 and instruction storage 6 are therefore carried out by separate memory chips which are accessed by the RSP chip 5. In order to maintain a record of return addresses for instruction branching, a 64 address capacity LIFO storage is required which must be immediately accessible by the first stage of the instruction pipeline. But the inclusion of such a large storage function on the RSP chip 5 would have consumed excessive chip area and dissipated excessive power. Alternately, the placement of the return address LIFO storage function in the data store 8 appeared to be unsuitable because a return address could not be accessed from the data store until two phases after the return instruction was read by the first stage, without degrading pipeline throughput. This problem is solved by the present invention as follows. The address sequencing control includes a 64 level stack 10 shown in Figure 5, located in data store 8 (memory locations 0 to 63). The value written into the 'top' of the stack 10, is also held in a single 16-bit hardware stack register 18 located in the instruction sequencing and fetch stage 1. This 64 level stack 10 which is addressed with a 6- bit stack pointer (SP) 28 allows nesting up to 64 levels of subroutine and interrupt routines. The instructions which affect the stack are: branch and stack unconditionally 'BS,' return 'RET,' and return and enable interrupts 'RET ENABLE.' Unmasked interrupts also affect the stack. The branch and stack 'BS' instruction causes the next sequential address (the value of the Sequential Address Register (SAR) 16) to be written into the stack register 18 at the end of Phase 2, and then implements an unconditional branch to the instruction address specified by the operand 'a' of the instruction. It also increments the stack pointer (SP) 28 as shown in Figure 4, by one (i.e. SP = SP + 1) by the end of Phase 2 and then during Phase 3, it writes the value of the SAR 16 into the data store stack 10 at the address pointed to by the SP 28. Thus the updated stack pointer register 28 always contains the address of the 'top' of the data store stack 10. The 'RET' type instructions cause the contents of the address pointed to by the stack pointer 28 (i.e., 'top' of stack) to be used as the address of the next instruction. Since this value is held in the stack register 18, it is available for use in the next cycle. In Phase 2, the stack pointer 28 is decremented by 1 (i.e. SP = SP - 1) to point to the next value in the stack 10, and then in phase 3 of the instruction, that value is read from the data store stack 10, and loaded into the stack register 18 at the end of Phase 3 of the 'RET' type instruction. This allows the return address just read from the data store stack 10 to be available for use by a subsequent 'RET' type instruction occurring at least one instruction away from any previous 'RET' type instruction. This is because the first 'RET' type instruction which reads the data store stack 10 and loads the value into the stack register 18 during its Phase 3, will have had time to complete this stack register update. Thus the RSP chip 5 has a 64 address stack 10 immediately available to its instruction fetch stage 1 without occupying excessive chip area on the LSI device. This is achieved by employing the otherwise unused second and third stages 2 and 3 of the RSP instruction pipeline during branch and return operations to access the stack 10 which is actually located in a partitioned area of the data store 8. As is shown in Figure 1, a stored program data processor is formed on an integrated circuit chip 5, having a pipelined instruction mechanism including four time-sequential stages with a first stage 1 for instruction sequencing and fetch, a second stage 2 for data store address generation, a third stage 3 for data store access, and a fourth stage 4 for arithmetic execution. These stages operate in an overlapped mode on successive instructions each including an op code and an operand, which are accessed from an instruction store 6 external to the chip 5, to carry out arithmetic operations on data accessed from a data store 8 external to the chip 5. The improved instruction branching mechanism is shown in more detail in Figures 3,4 and 5. A last-in-first-out instruction address stack 10 of Figure 5 is in a partitioned area of data store 8, for storing addresses for the instruction store 6. An instruction address multiplexer 12 of Figure 3 is in the first stage 1 and has an output 13 conected to an address input of the instruction store 6 and having a plurality of inputs, for inputting instruction addresses to the instruction store 6. An instruction address incrementer 14 of Figure 3 is in the first stage 1 and has an input connected to the output 13 of the multiplexer 12 and an output connected through a sequential address register (SAR) 16 to one of the inputs of the multiplexer 12, for sequentially incrementing the instruction store addresses by unity. A stack register 18 of Figure 3 is in the first stage 1 and has an input selectively connected to either an output of the sequential address register 16 or to an output 17 from the instruction address stack 10 in the data store 8, for storing the last instruction store address outputted from the incrementer 14 or storing the last instruction store address outputted over line 17 from the instruction address stack 10 in the data store 8 and has an output selectively connected to either an input to the multiplexer 12 orto an input over line 19to the instruction address stack 10 in the data store 8. Stack register 18 stores only a single address. An instruction sequencing decoder (sequencing controls) 20 of Figure 3 is in thefirst stage 1 and has an input connected to an output 7 of the instruction store 6 and an output 21 connected to the multiplexer 12, for selectively controlling the connection of the instruction store 6 address input 13, through the multiplexer 12, to eitherthe sequential address register 16 output or to the stack register 18 output in response to the op code of the last instruction word accessed from the instruction store 6 over line 7. The multiplexer 12 can have one of its plurality of inputs connected to the output 7 of the instruction store 8for selectively transferring the operand of the last instruction accessed therefrom as an unconditional branch address input to the instruction store 6 in response to the decoding of the associated op code in the instruction sequencing decoder 20. A data store accessing decoder 22 of Figure 4 is in the second stage 2 and has an input 7 connected to the instruction store 6 output, for decoding the op code from the last instruction accessed from the instruction store 6. A data store address generator 24 of Figure 4 is in the second stage 2 and has an input 7 connected to the instruction store 6 output, a control input 25 connected to the data store accessing decoder 22, and an output 26, for selectively generating a data store 8 address from the operand of the last accessed instruction word in response to the decoding of the associated op code in the data store accessing decoder 22. A stack pointer 28 of Figure 4 is in the second stage 2 and has a control input 25 connected to the data store accessing decoder 22 and an output 29, for selectively incrementing or decrementing a data store address value for accessing the last instruction address stored in the instruction address stack 10 in the data store 8. A data store address register 30 of Figure 5 is in the third stage 3, and has an input connected to the data store address generator 24 output 26 and to the stack pointer 28 output 29, and an output 31 connected to the address input of the data store 8, for accessing a location in the data store 8. In a branch operation, the instruction sequencing decoder 20 selectively controls the transfer of the operand of an unconditional branch instruction through the multiplexer 12 to the address input 13 of the instruction store 6 in response to the associated branch op code, selectively controls the incrementing of the sequential address register 16 by unity and loads the contents thereof into the stack register 18 in response to the associated branch op code, and selectively controls the nondestructive outputting of the contents of the stack register 18 over line 19 to the data input 32 of the data store 8 in response to the associated branch op code. The data store accessing decoder 22, in response to the branch op code, selectively controls the incrementing of the stack pointer 28 by unity and the outputting of its contents to the data store address register 30 as the address of the location in the instruction address stack 10 for storing the contents of the stack register 18 as the return address from the branch specified in the branch op code. During the above branch operation, the instruction sequencing decoder 20 in the first stage 1, carries out its controlling operations during a first phase or interval upon the occurrence of the branch instruction. The data store accessing decoder 22 in the second stage 2, carries out its controlling operations during a second phase following the first phase. And the data store address register 30 in the third stage 3 accesses the data store 8 at the location in the instruction address stack 10 and the data store 8 stores the contents of the stack register 18 there, during a third phase following the second phase. In this manner, the otherwise unused second and third stages 2 and 3 are employed during a branching operation to access the instruction stack 10 which is not located on the integrated circuit chip 5. In a return operation, from a previous branch operation, the instruction sequencing decoder 20 in the first stage 1, during a first phase, selectively controls the transfer of the contents of the stack register 18 through the multiplexer 12 to the address input 13 of said instruction store 6 in response to a return instruction. The data store accessing decoder 22, in the second stage 2, during a second phase following the first phase and in response to the op code of the return instruction, selectively controls the decrementing of the stack pointer 28 by unity and the outputting of its contents to the data store address register 30 in the third stage 3 for accessing the last instruction address stored in the instruction address stack 10 in the data store 8. The instruction sequencing decoder 20, in the first stage 1, during a third phase following the second phase, selectively controls the loading over line 17 into the stack register 18 of the last instruction address accessed from the instruction address stack 10 in the data store 8. In this manner, the return address can be used to access the instruction store 6 when a return instruction occurs at least one cycle from the previous return instruction, even though the instruction address stack 10 cannot be accessed in the data store 8 until the third interval. The following is a more detailed description of certain elements of the Real Time Signal Processor. Instruction Sequencing & Fetch Stage - Phase 1 This stage 1 shown in Figure 3 implements only Phase 1 of the instruction execution. In this stage, the 8-bit op code of the previous instruction is decoded, the address of the current instruction is determined based on the Condition Codes in the processor and the decode of the previous instruction op code, and the current instruction is fetched from Instruction Store 6. The value of the Program Counter (i.e. the current instruction address) is selected from either the next sequential address 16 or one of a number of possible branch addresses. The address selection is under program and/or interrupt control. In all cases, the address of the current instruction is entirely resolved during Phase 1 of an instruction execution in order that branching can occur in one instruction cycle. M(a, Xi, B) is the Mask function which is used for circular buffer operations. In order to provide efficient control over various signal processing data structures, a number of instructions are provided for updating the registers that are used in the formation of the effective address (i.e. X1, X2, W1, and W2). These instructions complete execution in the Second Phase unless they involve Data store operations. Data Store writes are completed in the third phase. Operations which read Data Store 8 perform the read operation and Stage 2 register update in Phase 3 so that the updated registers are available in the following phase (cycle). For Data Store operations, the effective addresses are generated by the Stage 2 logic and passed to the Data Store Address Register (DSAR) 30 at the end of Phase 2, in preparation for access in Phase 3. During Phase 3 of an instruction execution (the memory access phase), the Data Store 8 is accessed at the effective address. The Address Generation Stage hardware 2 passes the effective address, calculated in the previous cycle (phase), to the Data Store Stage 3 of Figure 5 for use in the present phase. For Read operations, the Data Store output is loaded into the appropriate register specified by the op code of the previous instruction. This is done at the completion of Phase 3 of that instruction in preparation for use during Phase 4. Some instructions do not access Data Store 8 for operand but require the immediate operand to participate in the arithmetic of Phase 4. In this case the Data Storage Stage forms a conduit for passage of the instruction operand 'a' from the Stage 2 hardware to the Stage 4 hardware for use during Phase 4 of the instruction. In order to maintain coherent execution of instructions, the execution of all four phases must remain fixed relative to one another. For this reason, when an external device requires access to the Data Store 8 it must do so through the I/O stage 24, and the entire pipeline must be stopped. This process is referred to as a Cycle Steal operation. Any I/O access of Data Store 8 will result in a Cycle Steal operation which will delay the pipeline execution for one machine cycle. All four phases/stages are delayed. In the fourth and final phase of an instruction execution, the Arithmetic Stage 4 executes the actual arithmetic operation defined in the instruction. Most instructions in the set of arithmetic operations, execute in a single cycle of the Arithmetic Stage 4. However, the multiply, divide, and arithmetic left shift, instructions require multiple executions of this stage in order to complete. The multiply instruction requires up to 8 cycles, the divide requires 17 cycles, and the left shift instruction requires 1 more cycle (in Phase 4) than the shift count (0 to 31). In these cases, the first three stages/phases 1, 2, and 3 of the instruction execution are "frozen' while Stage 4 for the present instruction is allowed to execute until the instruction is completed. The functions of the I/O stage 34 can be divided into 2 major areas: Direct I/O, and Externally Controlled I/O. The following is a brief description of each function. 1) Direct I/O - This allows the processor to input or output a single word to an External device under Program Control. 2) Externally Controlled I/O - This allows an External Device the capability to directly read out of or write into an RSP under control of the External Device. Other features provided in the RSP include a Real Time Clock, a Maintenance Interface with the capability to allow a Scan In/Scan Out of all registers and latches in the RSP, and an 1/O Interface with the capability to allow an External Device to control the RSP by issuing a set of Function Commands. Two examples of the instruction pipeline are shown in Figure 2. Example 1 shows a single instruction being executed. Phases 1 through 4 refer to the four functions performed on the instruction by the four hardware stages. The cycles refer to machine cycles. This example illustrates the instruction 'AZ Z, a(M1 )' which adds the contents of the Masked Memory location M(a, X1, B) to the contents of the Z register and places the sum into the Z Register. The instruction operand 'a' is modified by the register set X1, B, and M to form the masked effective address (ea) = M(a, X1, B) in Stage 2 and the storage location is accessed in Stage 3. The sum is formed and loaded into the destination register in Stage 4. 1) 'LZ a1(M1)' - Load the contents of Masked Memory location M(al, X1, B) into the Z Register. 2) 'AZ Z, a2(M1)' - Add the contents of Masked Memory location M(a2, X1, B) to the Z Register, and place the result into the Z Register. 4) 'B a4' - Branch to instruction address (a4). A no-operation instruction 'NOP' is inserted in the instruction pipeline in order to allow time for the fourth stage 4 of the pipeline to complete for the 'AZ' instruction before the third stage of the 'STZ' instruction performs the storage operation to move the result. The unused cycles retain their position in the instruction pipeline. DETAILED DESCRIPTION OF OPERATION This section describes in detail the operation of the hardware stages of the RSP. It includes the details of (1) How the instructions are fetched and decoded, (2) How the effective address is generated and used, and (3) How the various Condition Codes and registers (SAR, STACK, etc.) are set and interpreted. This stage is depicted in the flow diagram of Figure 3. It implements the Phase 1 function of execution of the instruction pipeline. This Stage contains the Instruction Address Selection Logic which controls the Instruction Store 6. The Instruction Store 6 which is 24 bits wide, is made up of an 8-bit op code field and a 16-bit operand field. It is addressed by the Program Counter (PC) multiplexer 12. The PC Mux output 13 which is 16 bits, is capable of addressing an Instruction Store 6 of up to 65536 instructions. During Phase 1 of an instruction execution, the Instruction Address Selection Logic decodes the 8-bit op code from the previous instruction to determine the source for the address of the present instruction. The address is selected by the PC Mux 12 and the instruction is accessed. Op codes from the previous instruction which call out Branch, Proceed, or Return, operations cause the address of the instruction being fetched to be taken from one of five branch sources. All other op codes cause the current instruction address to be taken from the Sequential Address Register (SAR) 16 which contains the address of the last instruction fetched (PC) plus one. The instruction address generation and fetch operations are performed in the same cycle to ensure that branching takes place in one cycle. The PC Mux 12 selects the current instruction address from among the following sources all of which are 16-bit registers. The Sequential Address Register (SAR) 16 is selected as the source for sequentially addressing Instruction Store 6. The STACK Register 18 is selected as the source for the return 'RET' type instructions. The Operand Field 'a' 36 of the current instruction is selected as the source for the unconditional branch instructions. It is also used for all conditional branch instructions if the conditional criterion is satisfied. otherwise the SAR 16 is selected. The SAVE Register 38 is used as the source for the address of the next instruction when the proceed 'PRCD' instruction, or those functions which specify a proceed are used (i.e. Instructions of the form -P-). The IARNector 40 is only used for I/0 Interrupt branches to words 1 to 63 of Instruction store which themselves contain a Branch to the address of the appropriate Interrupt handling routine. All arithmetic instructions set Condition Codes 1 thru 5 at the end of Phase 4. For multiply, divide, and arithmetic left shift instructions which require multiple cycles of Phase 4 to complete, the Condition Codes are set after the fourth phase completes. The External Overflow (Condition Code 6) is determined in Phase 3 and set in Phase 4. The Index Compare Flag (7) is generated in the Address Generation Stage and is set in Phase 2 of its instruction execution. The Software Flag is set under program control in Phase 2. Condition Codes 4, 6 and 8 are latched and remain set to 1 until specifically used, at which time they are reset to 0 in Phase 2 ofthe branch instruction which uses them. All other Condition Code bits are set by each operation which affects them. The conditional branch instructions are implemented in Phase 1 of the instruction execution and therefore, are based on the conditions as they exist at that time. Some Branch instructions are based on Condition Codes from the Arithmetic Stage 4. These branches are based on the conditions which are set as a result of arithmetic instructions coded three cycles prior to the Branch or earlier. 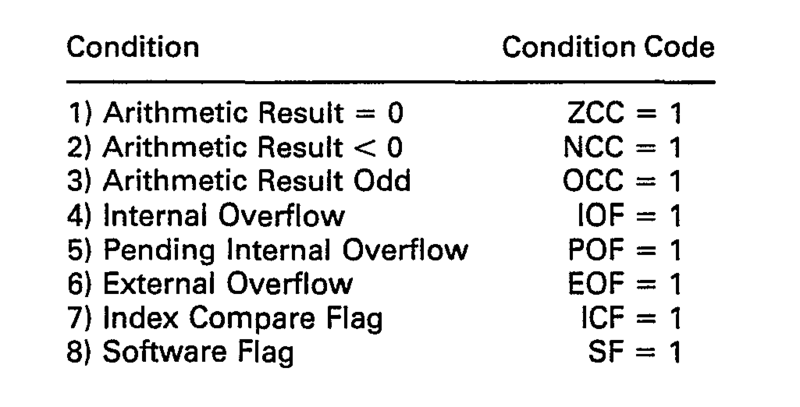 The Branch on Index Compare Flag (BICF) is based on a condition set as a result of some previous instruction. The Branch on External Overflow instruction is based on a condition set 3 cycles or more prior to the branch instruction. Branch and stack unconditionally 'BS', Return 'RET', and Return and Enable Interrupts 'RET ENABLE'. Unmasked Interrupts also affect the Stack 10. The Branch and Stack'BS' instruction causes the next sequential address (the value of the SAR 16) to be written into the Stack Register 18 at the end of Phase 2, and then implements an unconditional branch to the instruction address specified by the operand 'a' 36 of the instruction. It also increments the Stack Pointer (SP) 28 by one (i.e. SP = SP + 1) by the end of Phase 2 and then during Phase 3, it writes the value of the SAR 16 into the Data Store Stack 10 at the address pointed to by the SP 28. Thus the updated Stack Pointer register 28 always contains the address of the'Top' of the Data Store Stack 10. The 'RET' type instructions cause the contents of the address pointed to by the Stack Pointer 28 (i.e. 'Top' of Stack) to be used as the address of the next instruction. Since this value is held in the Stack Register 18, it is available for use in the next cycle. In phase 2, the Stack Pointer 28 is decremented by 1 (i.e. SP = SP - 1) to point to the next value in the Stack 10, and then in Phase 3 of the instruction, thatvalue is read from the Data Store Stack 10, and loaded into the Stack Register 18 at the end of phase 3 of the 'RET' type instruction. This allows the return address just read from the Data Store Stack 10 to be available for use by a subsequent 'RET' type instruction occuring at least one instruction away from any previous 'RET' type instruction. This is because the first'RET'type instruction which'reads'the Data Store Stack 10 and loads the value into the Stack Register 18 during its Phase 3, will have had time to complete this stack Register update. However, if an 'RET' type instruction immediately follows another 'RET' type instruction, the hardware must handle this in a special manner. This is because when the second 'RET' type instruction is decoded and fetched, the decoder 20 says that the address for the instruction after the second 'RET' type is the value in the Stack Register 18. However, the Stack Register 18 is still pointing to the second 'RET' type instruction, thus it will be fetched again. There is no problem with the first fetch of the second 'RET' type instruction, but the second fetch of the second 'RET' type instruction attempts to update the Stack Pointer 28 in its Phase 2 (Phase 3 of the first fetch of the second 'RET' type instruction). If this happened, the Stack Pointer 28 would be pointing to the wrong place. Thus the decoder 20 must insert a NO-OP signal on line 7 in place of the normal return instruction in Phases 2, 3, and 4 of the second fetch of the second 'RET' type instruction so that the decoder 22 will inhibit the Stack Pointer 28 from getting updated a second time and decoder 75 will inhibit the reading of data store 8 a second time. The result of this hardware generated NO-OP operation will be that the first fetch of the second 'RET' type instruction will operate normally, but the second fetch of the second 'RET' type instruction will operate as normal in Phase 1 and behave as a 'NOP' instruction, in Phases 2, 3, and 4. Athird consecutive'RET' type instruction will be treated like the first since it follows an effective'NOP' rather than an'RET'type instruction. The operation with two or more consecutive return instructions is as follows. During the first machine cycle, the value stored in the stack register 18 will be S and the value stored in the stack pointer 28 will be i. The instruction sequencing decoder 20 in the first stage 1 decodes a previous instruction during the first cycle, and controls the multiplexer 12 to input on line 13, a first address to the instruction store 6, fetching a first instruction from the instruction store 6. At the start of the second machine cycle, the stack register 18 is storing S, and the stack pointer 28 is storing i. The instruction sequencing decoder 20 in the first stage 1 decodes the first instruction as a first return instruction during the second cycle following the first cycle, and controls the multiplexer 12 to transfer the contents S, of the stack register 18 as a second address to the instruction store 6, fetching a second instruction from the instruction store 6. The data store accessing decoder 22 in the second stage 2 decodes the first instruction as the first return instruction during the second cycle and controls the stack pointer 28 to decrement its contents by unity to a value i-1 which is output to the data store address register 30 in the third stage 3 as a first data store 8 address for the instruction address stack 10. At the start of the third machine cycle, the stack register 18 is storing Si and the stack pointer 28 is storing i-1. The instruction sequencing decodes 20 in the first stage 1 decodes the second instruction as a second return instruction during the third cycle following the second cycle, and controls the multiplexer 12 to again transfer the contents S which still occupies the stack register 18, as the second address to the instruction store 6, again fetching the second instruction from the instruction store 6. The instruction sequencing decoder 20 in the first stage 1 has a No-Op output connected via line 7 to the data store accessing decoder 22 in the second stage 2 and to the op code decoder 75 in the third stage 3, for outputting a No-Op signal on line 7 upon the detection of the second return instruction during the third cycle. The data store accessing decoder 22 in the second stage 2 decodes the second instruction as the second return instruction during the third cycle and controls the stack pointer 28 to decrement its contents by unity to a value i-2 which is output to the data store address register 30 in the third stage 3 as a second data store 8 address for the instruction address stack 10. The op code decoder 75 in the third stage 3 decodes the first instruction as the first return instruction during the third cycle and controls the data store 8 to access a first datum from the instruction address stack 10 at the first data store address i-1 and output the first datum as the value SI-1 to the stack register 18 over line 17 in the first stage 1. At the start of the fifth machine cycle, the stack register 18 is storing SI-2 and the stack pointer 28 is storing i-2. The instruction sequencing decoder 20 in the first stage 1 decodes the third instruction as a first next instruction during the fifth cycle following the fourth cycle, and controls the multiplexer 12 to input a first next instruction address to the instruction store 6, fetching a fourth instruction from the instruction store 6. The data store accessing decoder 22 in the second stage 2 decodes the third instruction as the first next instruction during the fifth cycle, and controls the data store address generator 24 to output a first next data store address to the data store address register 30 in the third stage 3. The op code decoder 75 in the third stage 3 omits operations on the data store 8 during the fifth cycle, in response to the No-Op signal on line 7. The contents of the stack register 18 and stack- pointer 28 do not change for the sixth machine cycle, in this example. The instruction sequencing decoder 20 in the first stage 1 decides the fourth instruction as a second next instruction during the sixth cycle following the fifth cycle, and controls the multiplexer 12 to input a second next instruction address to the instruction store 6, fetching a fifth instruction from the instruction store 6. The data store accessing decoder 22 in the second stage 2 decodes the fourth instruction as the second next instruction during the sixth cycle, and controls the data store address generator 24 to output a second next data store address to the data store address register 30 in the third stage 3. The op code decoder 75 in the third stage 3 decodes the third instruction or the first next instruction during the sixth cycle and controls the data store 8 to access a third datum at the first next data store address, In this manner, the instruction store accessing operations for two consecutive return instructions are expanded in time. It should be understood that an equivalent way to generate the No-Op signal discussed above would be in the data store accessing decoder 22 instead of the instruction sequencing decoder 20, as disclosed. The above operation for two consecutive return instructions will automatically accommodate any number of consecutive returns. If there are 2N consecutive return instructions, they will be carried out in 3N machine cycles with every third cycle having a No-Op automatically generated by the hardware as described above. If these are 2N + 1 consecutive return instructions, they will be carried out in 3N + 1 machine cycles, N of which are hardware generated No-Ops and 2 N + 1 of which are return instructions, with N = 0 or any positive integer. Finally, the receipt of any unmasked Interrupt affects the STACK 10 by causing the appropriate return address of the interrupted program to be 'pushed' into the STACK Register 18 prior to being written into Data Store 8 using the Stack pointer 28 incremented by 1 (i.e. SP = SP + 1) as the address. The Interrupt causes a branch to the appropriate Interrupt Entry Address in Instruction Store 6. 5) Stack Pointer Register update. Figure 4 shows the functional flow diagram for this stage. All control registers in this stage (except the Stack Pointer 28), are 16 bits in length. The Stack Pointer 28 is 6 bits long. The following table lists these control registers with their associated names. Adder 1 (52) is a bit 2's complement adder with additional logic to develop the greater than and less than or equal to functions. Adder 1 can form the complement of a value on the right input for subtraction. Separate control over the carry into the LSB is provided. This allows the adder to perform 2's complement arithmetic or to insert a 1 bit offset which is used in the compare function to create the "Less than or Equal" function. Adder 2 is also a 16 bit 2's complement adder. 1) The 16 bit operand field 'a' 36 of the instruction. 2) The 16 bit output to the SAVE Register 38. 3) The Effective Address output (16 bits) to the Data Store Stage 3. 4) The 16 bit input and output busses to the Data Store Stage 3. 5) The op code for control purposes. 6) The Index Compare Flag. (Contained in STATUS Register S1). 7) The Software Flag. (Contained in STATUS Register S1). The generation of the Effective Data Store Address on line 26 involves the implementation of one of the four forms of the address specification. The four forms were previously described. All Effective Addresses are available at the end of Phase 2 of the instruction execution. They are passed to the Data Store Stage 3 for use in Phase 3. Index Register Arithmetic - This function is performed through the use of Adder 1, the X Registers, the W Registers 49, and the feedback of Adder 1 to the Index (X) Registers. The functions which can be performed are: Xi = Xi + a, Xi = Xi + Wj, and Xi = Xi Wj, i = 1,2 and j = 1,2. These operations are performed during Phase 2 of the instruction execution. Index Register Testing- An Index Compare Flag (ICF) is generated from the results of Adder 1 and is used by the conditional Branch instruction 'BICF'. The adder compares the selected Index Register with either the operand field 'a' or the selected 'W' Register, by performing a subtract of the immediate value (or the appropriate 'W' Register) from the appropriate Index Register, without affecting the contents of the Index Register. The flag is set to the result of the test specified (>,2:, <, ≤). This test takes place during Phase 2 of the instruction execution, and the compare flag is set at the end of Phase 2. A 'BICF' instruction which branches on the result of this compare, will be effective if coded on the next instruction. SA VE Register Calculation - The feedback path from Adder 1 to the Index Registers is also made available to the SAVE Register 38. The SAVE Register is loaded at the end of Phase 2. This function is implemented by the ASV instruction. Index Register/Storage Interface - The index Registers interface to Data Store either directly or via the 'V' Register. The interface to the 'V' Register allows data to be temporarily held there (or loaded from there) if desired. Reads of Data Store 8 cause the Data Store contents to be latched into the appropriate Index Register at the end of Phase 3. Writes to Data Store occur during Phase 3. The Transfer (V) Register 50 is used to form a path between Data Store 8 and all of the control registers for the Address Generation Stage 2. This path is bi-directional, in that, data may be transferred from Data Store to any control register or from the control registers to Data Store through the 'V' Register. The 'V' Register can also be used as a temporary residence of data between the Data Store 8 and all of the control registers. Data is loaded from the 'V' Register to the destination register during Phase 2 of the instruction. For transfers of these control registers to the 'V' Register, an effective direct path is provided back to the 'V' Register with the transfers occurring in Phase 2. Reads of Data Store 8 have the contents of Data Store delivered to the register pointed to by the op code of the current instruction, at the end of Phase 3. Writes to Data Store from the 'V' Register occur during Phase 3. The Data Store Stage 4 of Figure 5 is made up of the Data Store 8, the address select multiplexer and Data Store Address Register 30, the input selection multiplexer 54, and the output selection multiplexer. The Data Store Stage 3 performs the Data Store and fetch operations for the RSP. The Data Store 8 uses 16-bit words and is addressable up to 65536 words. A 16-bit address register 30 along with source selection logic is provided for selecting between the Effective Address generated by the Address Generation Stage 2 and the address provided by the I/O. Source selection is carried out by the op code decoder 75 which controls the multiplexer 54 and the data store address register 30 in response to op code inputs on line 7. For Write operations to Data Store 8, the data source selection is made from the output 70 of (1) the Arithmetic Stage 4, (2) the Address Generation Stage 2 (X1, X2, and V Registers), (3) the Stack Register 18 in the Instruction Fetch Stage 1, and (4) the I/0 34. The Data Store 8 output 56 is routed to the appropriate register specified by the op code of the current instruction at the completion of Phase 3, for use throughout Phase 4. Data Store Write operations take place, in Phase 3 of the instruction execution using the Effective Address generated in Stage 2. The data that is stored is the data which is available in the Source Register at the end of Phase 2. Data Fetch operations are performed in Phase 3 of instruction execution and the data is placed in the register pointed to by the op. code of the current instruction. For loads of the arithmetic stage 4 from Data Store 8, the data is put in the appropriate register at the end of Phase 3, and then during Phase 4 it is passed through the adder or multiplier (thus setting Condition Codes) and written into the destination register at the end of Phase 4 of the instruction. Input/Output logic 34 (1/0) usage of Data Store 8 occurs using a Cycle Steal operation. Whenever the I/O requires a Data Store operation, the pipeline is stopped while the cycle for Data.Store 8 is used by the I/O. Upon completion of a single Cycle Steal for the I/O operation the pipeline resumes. All Stages of the pipeline must stop together in order to maintain coherent execution of the instructions. For instructions which require an operand value 'a' in the Arithmetic Stage 4 for Phase 4 operations, such as 'AZ Z,a(I)' (add immediate 'a' to Z and place result in Z), a path is provided from the Data Store Address Register 30 to the appropriate register in Stage 4. This path makes the operand 'a' of the instruction, which was placed onto the Effective Address lines by the Address Generation Stage, available as input data to the Arithmetic Stage 4. This is possible because those operations which require the operand for Phase 4 do not make use of the Data Store 8 access function in their execution. The resulting instruction pipeline architecture for the real time signal processor chip takes advantage of unused instruction phases during the branch and return operations, to enable the accessing of a 64 address (LIFO) Stack which is located in a partitioned area of the data store. Thus, even though the actual location of the instruction stack is several instruction phases beyond the instruction fetch stage, the contents of the address stack are immediately. available with the aid of the stack register in the first instruction stage. Furthermore, excessive chip area and power are not consumed by the address stack on the processor chip, which would otherwise have had to be included on the chip in order to be immediately available to the instruction fetch stage. Still further, the partitioned size of the address stack in the data store can be decreased and the saved area used for additional data storage. whereby said otherwise unused second (2) and third (3) stages are employed during a branching operation to access said instruction stack (10) which is not located on said integrated circuit chip (5). said data store address register (30) in said third stage (3) accessing said data store (8) at said location in said instruction address stack (10) and said data store (8) storing said contents of said stack register (18) thereat, during a third phase following said second phase. whereby the return address can be used to access said instruction store (6) when a return instruction occurs during said first phase, even though the instruction address stack (10) cannot be accessed in said data store (8) until said third phase. whereby said otherwise unused second and third stages are employed during a branching operation to access said instruction stack which is not located on said integrated circuit chip. said data store address register in said third stage accessing said data store at said location in said instruction address stack and said data store storing said contents of said stack register thereat, during a third phase following said second phase. whereby the return address can be used to access said instruction store when a return instruction occurs during said first phase, even though the instruction address stack cannot be accessed in said data store until said third phase. accessing said data store by said data store address register in said third stage, at said location in said instruction address stack and storing in said data store said contents of said stack register, during a third phase following said second phase. whereby said otherwise unused second and third stages are employed during a branching operation to access said instruction stack. whereby the instruction store accessing operations for two consecutive return instructions are expanded in time. said op code decoder in said third stage decoding said third instruction as said first next instruction during said sixth cyycle and controlling said data store to access a third datum at said first next data store address. NL8006163A (en) * 1980-11-12 1982-06-01 Philips Nv Device for the sorting of data words according to the values ​​of in each case associated attribute numbers. DE3751503D1 (en) * 1986-03-26 1995-10-12 Hitachi Ltd to decode data processor in a pipelined structure with the ability to execute multiple instructions in parallel and.